Maîtres du Temps Chapter Two is just what it says on the exclusive watchbox; Masters of Time, and this particular limited edition is Chapter Two, created by two of the most talented contemporary watchmakers in the world, Daniel Roth and Peter Speake-Marin. 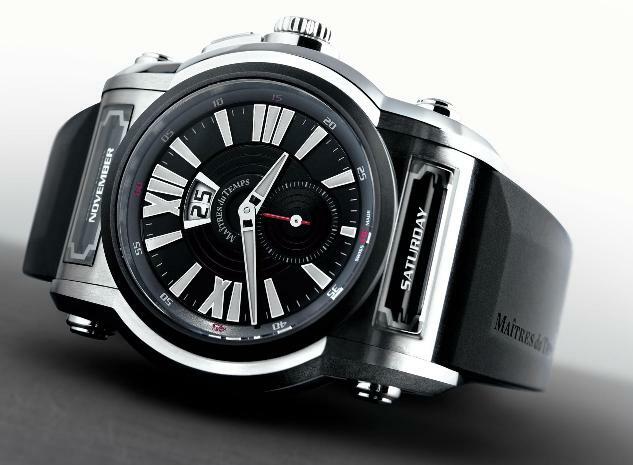 Maîtres du Temps watches have achieved a level of technical and design sophistication which matches the ambitions of the master watchmakers behind them. The Chapter Two timepiece is nicknamed TCR, for Triple Calendar Round. The movement was developed by Vaucher Manufacture Fleurier, the Swiss manufacturer that also makes exclusive calibres for Parmigiani. Like other Maîtres du Temps watches, the TCR includes cylindrical rollers to indicate the day of the week and the month, placed at the top and bottom of the dial. The case is made of high grade 5 titanium, and the rollers are seamlessly integrated into the casing with a PVD black coating to give them standout against the sheen of the dial's casing. The oversized indices include Roman numerals at 12, 3 and 9 o’clock, filled with Sueprluminova that glows green in dark conditions. The inner chapter ring features Arabic numerals and are indicated by a red small seconds hand. There’s a large date window at 12 o’ clock while the date and month leap out at you from the rollers. 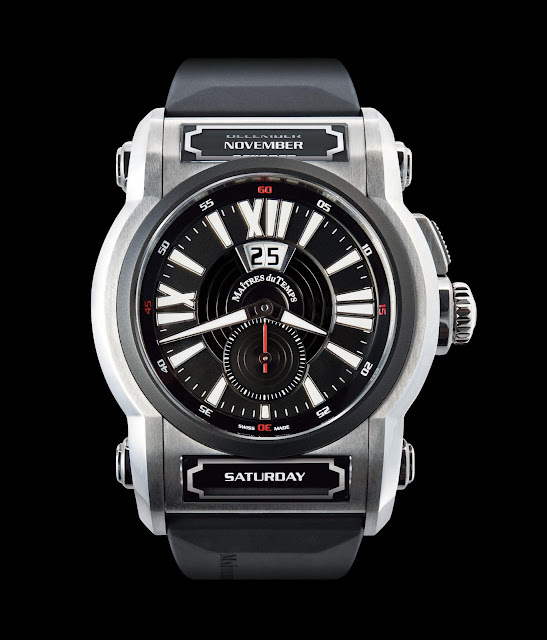 Hours and minutes are indicated by diamond-cut titanium hands. Six anti-reflective sapphire crystals—three on the front and three on the caseback—provide unmatched visual access to both the indications and movement. The dial display is achieved with three sapphire crystals lenses, one for the main dial and two curved crystal lenses over the rollers. The rollers are changed easily with the use of two pushers, each engraved with their function and featured discreetly on the caseback. The pusher to adjust the big date, whose function is similarly identified, is located in the caseband at 2 o’clock. 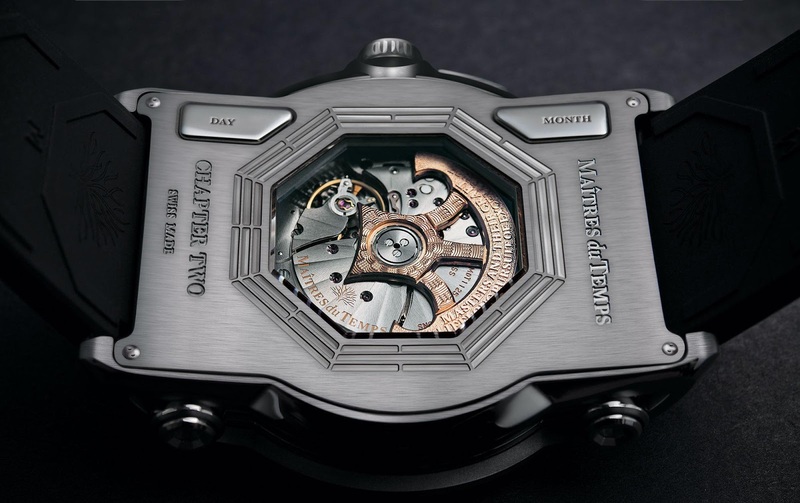 Turn the watch over and the case back reveals a glimpse of the calibre SHC01 movement. The movement incorporates an intricate guilloche rotor as part of the automatic winding system, bearing the Maîtres du Temps motto: Masters and Their Craft—A Lifelong Pursuit of Excellence. The excellence in terms of the movement runs to a number of ornate finishes including sun-ray côtes de Genève on the polished hand-beveled bridges, helical spirals, perlage on the mainplate, and mirror-polished screw heads. The watch comes on a deliberately more casual and sporty black, natural rubber strap with titanium folding buckle. Each of the three models (titanium, PVD, and two-tone) will be limited to just 50 pieces worldwide and priced at $69,000. As Daniel Roth observed: "The watch is totally unlike anything that any of us would have done alone but is the result of us working together."